MOSCOW, Russia -- A jailed Ukrainian pilot on Friday refused to give up a hunger strike, after rejecting food and water in protest at delays in her controversial murder trial in Russia, her lawyers said. Savchenko's defence lawyers visited her Friday at her detention centre in southern Russia but failed to persuade her to stop the hunger strike. "Our arguments did not work," lawyer Nikolai Polozov told AFP. "Her only demand is that she be immediately returned to Ukraine." He added that Savchenko was refusing to allow prison officials or doctors to touch her and any attempts to force-feed her would be seen by her as "torture". He said she had not been drinking water since the trial was adjourned on Thursday. In a letter released by her lawyers Savchenko said she would fast until she was returned home "alive or dead." "Freedom has no price," the letter said. Her supporters are concerned that by refusing to drink water she may damage her health irreparably or not live long enough to attend the next hearing set for Wednesday. Refusing both food and water is known in Russia as a "dry hunger strike" and was a method of last resort for some Soviet dissidents under Communism. Savchenko has fasted before to protest the accusations against her but has never before refused both food and water. She has already refused food for more than 80 days but broke off her hunger strike in March last year because of severe health problems. Polozov said her defence team would not be able to visit her this weekend and during public holidays on Monday and Tuesday in Russia. If she is not in court on Wednesday, her lawyers would start looking for her in hospitals, Polozov said. Another member of the defence team, Mark Feigin, called on Ukrainians all over the world to stage rallies in her support Wednesday. "It's crunch time because of Nadiya's hunger strike," he tweeted. President Vladimir Putin's spokesman declined to comment on Savchenko's decision to fast. "This is not an issue that has anything to do with our agenda," said Dmitry Peskov. But few doubt that her fate will be decided in the Kremlin, and Western leaders as well as Ukrainian President Petro Poroshenko have called on Putin to let Savchenko go. 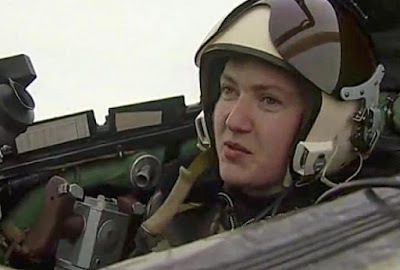 On Wednesday, the prosecution requested a 23-year prison sentence for Savchenko and a fine of 100,000 rubles ($1,360). Two journalists from Russian public broadcaster VGTRK died in shelling in June 2014, in Ukraine's eastern Luhansk region. Prosecutors say Savchenko was involved in the killing in her capacity as a volunteer in a Ukrainian battalion. She denies the charges and says she was kidnapped and smuggled into Russia. Savchenko has been elected in absentia to Ukraine's parliament since being held in Russia. Initially she had planned to launch a hunger strike after the verdict, according to the text of her final word posted on her Facebook page. Poroshenko said on Friday Ukraine would "redouble efforts" to win Savchenko's return, while lawmaker and former premier Yulia Tymoshenko called on her to halt the strike. "Your family and the whole of Ukraine need you!" said Tymoshenko. The US State Department reiterated its call for Savchenko to be released "immediately." "We want to see her released and sent home where she belongs," said spokesman John Kirby.